"Harmakhis" redirects here. For the planet, see Mars. The earliest recorded form of Horus is the tutelary deity of Nekhen in Upper Egypt, who is the first known national god, specifically related to the ruling pharaoh who in time came to be regarded as a manifestation of Horus in life and Osiris in death. The most commonly encountered family relationship describes Horus as the son of Isis and Osiris, and he plays a key role in the Osiris myth as Osiris's heir and the rival to Set, the murderer of Osiris. In another tradition Hathor is regarded as his mother and sometimes as his wife. 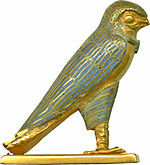 Horus served many functions, most notably being a god of kingship and the sky. Horus is recorded in Egyptian hieroglyphs as ḥr.w "Falcon"; the pronunciation has been reconstructed as ħaːruw. Additional meanings are thought to have been "the distant one" or "one who is above, over". As the language changed over time, it appeared in Coptic varieties variously as hoːɾ or ħoːɾ and was adopted into ancient Greek as Ὧρος Hōros (pronounced at the time as hoːɾos). It also survives in Late Egyptian and Coptic theophoric name forms such as Siese "son of Isis" and Harsiese "Horus, Son of Isis". After becoming pregnant with Horus, Isis fled to the Nile Delta marshlands to hide from her brother Set, who jealously killed Osiris and who she knew would want to kill their son. There Isis bore a divine son, Horus. Since Horus was said to be the sky, he was considered to also contain the sun and moon. It became said[by whom?] that the sun was his right eye and the moon his left, and that they traversed the sky when he, a falcon, flew across it. Later, the reason that the moon was not as bright as the sun was explained by a tale, known as The Contendings of Horus and Seth. In this tale, it was said that Set, the patron of Upper Egypt, and Horus, the patron of Lower Egypt, had battled for Egypt brutally, with neither side victorious, until eventually, the gods sided with Horus. As Horus was the ultimate victor he became known as ḥr.w wr "Horus the Great", but more usually translated "Horus the Elder". In the struggle, Set had lost a testicle, and Horus' eye was gouged out. Horus was occasionally shown in art as a naked boy with a finger in his mouth sitting on a lotus with his mother. In the form of a youth, Horus was referred to as nfr ḥr.w "Good Horus", transliterated Neferhor, Nephoros or Nopheros (reconstructed as naːfiru ħaːruw). The Eye of Horus is an ancient Egyptian symbol of protection and royal power from deities, in this case from Horus or Ra. The symbol is seen on images of Horus' mother, Isis, and on other deities associated with her. In the Egyptian language, the word for this symbol was "wedjat" (wɟt). It was the eye of one of the earliest of Egyptian deities, Wadjet, who later became associated with Bastet, Mut, and Hathor as well. Wadjet was a solar deity and this symbol began as her all-seeing eye. In early artwork, Hathor is also depicted with this eye. Funerary amulets were often made in the shape of the Eye of Horus. The Wedjat or Eye of Horus is "the central element" of seven "gold, faience, carnelian and lapis lazuli" bracelets found on the mummy of Shoshenq II. The Wedjat "was intended to protect the king [here] in the afterlife" and to ward off evil. Egyptian and Near Eastern sailors would frequently paint the symbol on the bow of their vessel to ensure safe sea travel. However, Set still refused to relent, and the other gods were getting tired from over eighty years of fighting and challenges. Horus and Set challenged each other to a boat race, where they each raced in a boat made of stone. Horus and Set agreed, and the race started. But Horus had an edge: his boat was made of wood painted to resemble stone, rather than true stone. Set's boat, being made of heavy stone, sank, but Horus' did not. Horus then won the race, and Set stepped down and officially gave Horus the throne of Egypt. After the New Kingdom, Set was still considered lord of the desert and its oases. In many versions of the story, Horus and Set divide the realm between them. This division can be equated with any of several fundamental dualities that the Egyptians saw in their world. Horus may receive the fertile lands around the Nile, the core of Egyptian civilization, in which case Set takes the barren desert or the foreign lands that are associated with it; Horus may rule the earth while Set dwells in the sky; and each god may take one of the two traditional halves of the country, Upper and Lower Egypt, in which case either god may be connected with either region. Yet in the Memphite Theology, Geb, as judge, first apportions the realm between the claimants and then reverses himself, awarding sole control to Horus. In this peaceable union, Horus and Set are reconciled, and the dualities that they represent have been resolved into a united whole. Through this resolution, order is restored after the tumultuous conflict. Egyptologists have often tried to connect the conflict between the two gods with political events early in Egypt's history or prehistory. The cases in which the combatants divide the kingdom, and the frequent association of the paired Horus and Set with the union of Upper and Lower Egypt, suggest that the two deities represent some kind of division within the country. Egyptian tradition and archaeological evidence indicate that Egypt was united at the beginning of its history when an Upper Egyptian kingdom, in the south, conquered Lower Egypt in the north. The Upper Egyptian rulers called themselves "followers of Horus", and Horus became the tutelary deity of the unified nation and its kings. Yet Horus and Set cannot be easily equated with the two halves of the country. Both deities had several cult centers in each region, and Horus is often associated with Lower Egypt and Set with Upper Egypt. Other events may have also affected the myth. Before even Upper Egypt had a single ruler, two of its major cities were Nekhen, in the far south, and Nagada, many miles to the north. The rulers of Nekhen, where Horus was the patron deity, are generally believed to have unified Upper Egypt, including Nagada, under their sway. Set was associated with Nagada, so it is possible that the divine conflict dimly reflects an enmity between the cities in the distant past. Much later, at the end of the Second Dynasty (c. 2890–2686 BCE), Pharaoh Seth-Peribsen used the Set animal to writing his serekh name in place of the falcon hieroglyph representing Horus. His successor Khasekhemwy used both Horus and Set in the writing of his serekh. This evidence has prompted conjecture that the Second Dynasty saw a clash between the followers of the Horus king and the worshippers of Set led by Seth-Peribsen. Khasekhemwy's use of the two animal symbols would then represent the reconciliation of the two factions, as does the resolution of the myth. Horus the Younger, Harpocrates to the Ptolemaic Greeks, is represented in the form of a youth wearing a lock of hair (a sign of youth) on the right of his head while sucking his finger. In addition, he usually wears the united crowns of Egypt, the crown of Upper Egypt and the crown of Lower Egypt. He is a form of the rising sun, representing its earliest light. In this form, he was represented as the god of light and the husband of Hathor. He was one of the oldest gods of ancient Egypt. He became the patron of Nekhen (Hierakonpolis) and the first national god ('God of the Kingdom'). Later, he also became the patron of the pharaohs, and was called the son of truth – signifying his role as an important upholder of Maat. He was seen as a great falcon with outstretched wings whose right eye was the sun and the left one was the moon. In this form, he was sometimes given the title Kemwer, meaning '(the) great black (one)'. Horus gradually took on the nature as both the son of Osiris and Osiris himself. He was referred to as Golden Horus Osiris. In the temple of Denderah he is given the full royal titulary of both that of Horus and Osiris. Some accounts have Horus Osiris being brought back to life by Isis, but there is no proven connection with the story of Jesus, as some have suggested, and many serious scholars reject such a connection. Macrobius' Chronicon noted the annual ancient Egyptian celebration of Horus, specifying the time as the winter solstice. An analysis of the works of Epiphanius of Salamis noted the Egyptian winter solstice celebration of Horus in Panarion. Horus, patron deity of Hierakonpolis (near Edfu), the predynastic capital of Upper Egypt. Its head was executed by means of beating the gold then connecting it with the copper body. A uraeus is fixed to the diadem which supports two tall openwork feathers. The eyes are inlaid with obsidian. Sixth Dynasty. ^ Sims, Lesley (2000). "Gods & goddesses". A Visitor's Guide to Ancient Egypt. Saffron Hill, London: Usborne Publishing. p. 29. ISBN 0-7460-30673. ^ Meltzer, Edmund S. (2002). Horus. In D. B. Redford (Ed. ), The ancient gods speak: A guide to Egyptian religion (pp. 164). New York: Oxford University Press, USA. ^ Allen, James P. (2005). The Ancient Egyptian Pyramid Texts. Society of Biblical Literature. ISBN 978-1-58983-182-7. ^ New York Folklore Society (1973). "New York folklore quarterly". 29. Cornell University Press. p. 294. ^ Ian Shaw (2003). The Oxford History of Ancient Egypt. Oxford University Press. ISBN 978-0-19-815034-3. ^ Piotr O. Scholz (2001). Eunuchs and castrati: a cultural history. Markus Wiener Publishers. p. 32. ISBN 978-1-55876-201-5. ^ Roy G. Willis (1993). World Mythology. Macmillan. p. 43. ISBN 978-0-8050-2701-3. ^ "Horus". Ancient History Encyclopedia. Retrieved 2019-02-22. ^ "Lady of the West". hethert.org. Retrieved 18 January 2015. ^ a b Silverman, David P. (1997). "Egyptian Art". Ancient Egypt. Duncan Baird Publishers. p. 228. ^ "The Goddesses and Gods of Ancient Egypt". Archived from the original on 4 June 2010. ^ "Ancient Egypt: the Mythology – Horus". egyptianmyths.net. ^ Scott David Foutz. "Theology WebSite: Etext Index: Egyptian Myth: The 80 Years of Contention Between Horus and Seth". theologywebsite.com. Retrieved 18 January 2015. ^ "Figure of a Horus Falcon". The Walters Art Museum. ^ te Velde, Herman (1967). Seth, God of Confusion: A Study of His Role in Egyptian Mythology and Religion. Probleme der Ägyptologie 6. Translated by van Baaren-Pape, G. E. (2nd ed.). Leiden: E. J. Brill. ISBN 978-90-04-05402-8. ^ te Velde 1967, pp. 59–63. ^ Wilson, Erasmus (January 1, 1877). Cleopatra's needle: With brief notes on Egypt and Egyptian obelisks. London: Brain & Company. p. 208. Retrieved 6 December 2014. ^ Patricia Turner, Charles Russell Coulter, Dictionary of ancient deities, 2001. ^ "The Abydos Triad, Osiris, Isis and Horus, and Seth". www.reshafim.org.il. ^ Roxburgh, Kevin. "Horus - Egyptian God Horus - Egyptian Mythology - Horus - Eye of Horus". www.egyptiangods.co.uk. ^ "MACROBIUS, Saturnalia – Loeb Classical Library". Loeb Classical Library. Wikimedia Commons has media related to Horus.